Apple's chief executive Tim Cook announced a new role for Jonathan Ive, the company's senior vice president of industrial design: taking the lead in directing the design of the company's software, too. Apple quickly became associated with innovative design in computers, often to the point of being criticized for putting too much attention into minor details. Steve Jobs' infatuation with well designed products was reflected in the Apple II line and Lisa, but increasingly so in the 1984 Macintosh, which Jobs wanted to be as elegant and easy to use as a Cuisinart food processor. Jobs consulted with designer Jerry Manock in 1977, soon after founding Apple, and hired him to build the Apple Industrial Design Group tasked with developing iconic designs for Apple's computers. 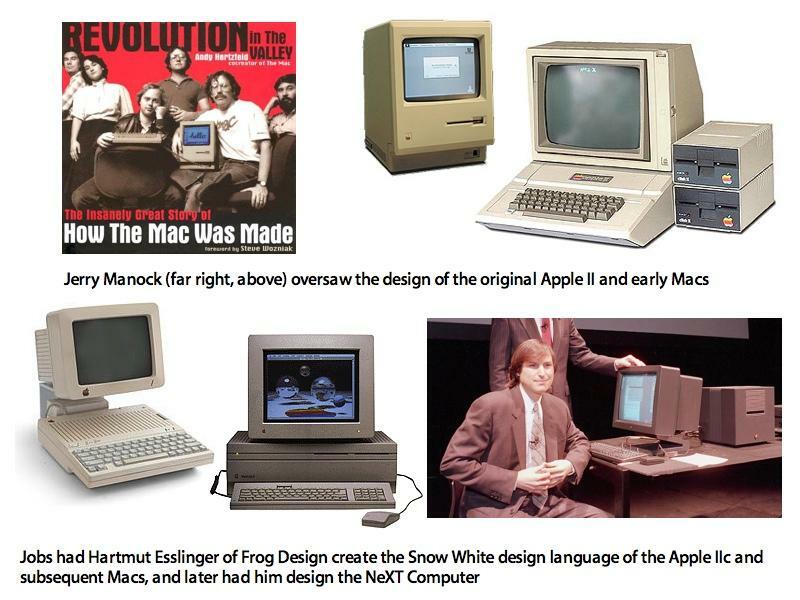 Apple continued to pursue design as an important ingredient in its products, initially working with famous designers (including Hartmut Esslinger of Frog Design) to develop the Apple Iic "Snow White" industrial design language, followed by Platinum. The designs reflected the parallel lines of the original Macintosh user interface. After Jobs was pushed out of Apple to launch NeXT in the mid 80s, he also hired Frog to develop the iconic design of the NeXT Computer. But the culture of design was also retained at Apple. In the late 80s, Apple's director of industrial design Robert Brunner worked with Sony to develop the 1991 PowerBook notebook, which radically rethought the design of portable systems, placing the keyboard next to the screen while leaving space for a trackball centered in a broad wrist rest in front of it, a layout that was briefly scorned as odd before the rest of the industry copied it. At the same time, Apple developed the Newton Message Pad as world's first mainstream tablet system, combining industrial design with new "soup" software development concepts, the design of ARM as an entirely new mobile chip architecture, and the company's operating system savvy to build a beautiful, functional product, even if it was too expensive to gain much traction. In 2007, Brunner, who ran Apple's design group from 1987 through 1996, gave a presentation at the Computer History Museum where he described three efforts to recruit Ive to work at Apple. He was finally successful in 1992. Ive's first task was to tweak the design of the original Message Pad. It was Apple's international reputation for advanced design that attracted Ive. In a 2007 interview with the Design Museum, Ive related, "I went through college having a real problem with computers. I was convinced that I was technically inept, which was frustrating as I wanted to use computers to help me with various aspects of my design. "Right at the end of my time at college I discovered the Mac. I remember being astounded at just how much better it was than anything else I had tried to use. I was struck by the care taken with the whole user experience. I had a sense of connection via the object with the designers. "I started to learn more about the company, how it had been founded, its values and its structure. The more I learnt about this cheeky almost rebellious company the more it appealed to me, as it unapologetically pointed to an alternative in a complacent and creatively bankrupt industry. Apple stood for something and had a reason for being that wasnt just about making money." In 1992, Ive joined Apple, first as a consultant and then as a full time employee. Ive described being frustrated in working as a consultant to the company, saying that it "made it difficult to have a profound impact on product plans and to truly innovate. By the time you had accepted a commission so many of the critical decisions had already been made. Increasingly I had also come to believe that to do something fundamentally new requires dramatic change from many parts of an organization." But as Ive began working at Apple, the company was falling into decline. Ive stated that "Apple had started trying to compete to an agenda set by an industry that had never shared its goals. While as a designer I was certainly closer to where the decisions were being made, but I was only marginally more effective or influential than I had been as a consultant."